The Key in the Hand, 2015, old keys, old wooden boat, red yarn, dimensions variable. Japan Pavillion 56th Venice Biennale, Italy. Photo by Sunhi Mang. Courtesy of the Artist. In Antiquity, knowledge of the body was restricted by religious beliefs and the ruling ethos. For centuries, several civilizations including the Greeks, Indians and the French, based part of their medical systems on the theory of “humorism”. Doctors considered that the body constituted 4 body fluids, black bile, yellow bile, phlegm and blood. 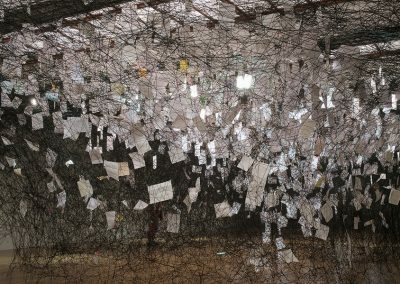 Whenever looking at the thread installations made by the Japanese artist Chiharu Shiota, the humorism theory sparks a light indicating a possible way to read to her enigmatic work. Her compositions are exclusively made with two colours: red and black, as she stated during a recent interview “these colours represent human life”. 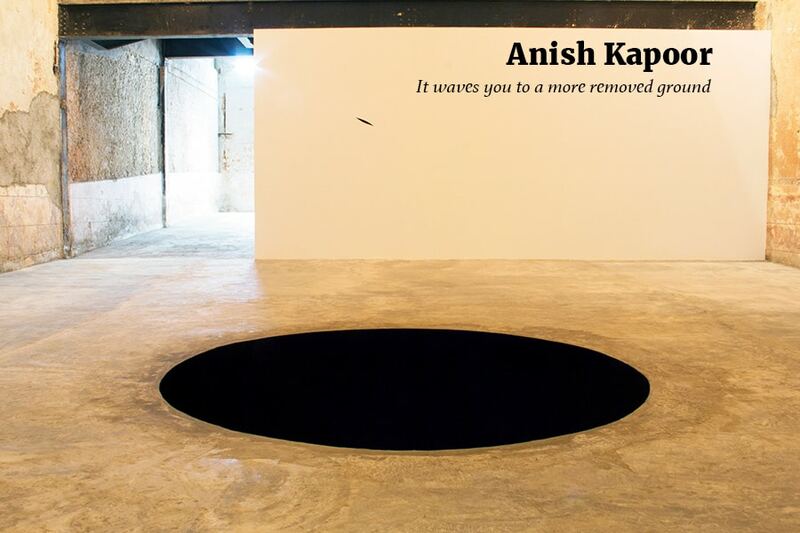 Hence, to the artist life emerges as a binary configuration, a continuous conflict between life and death. Like humorism, the world and human beings are composed of mysterious substances drifting from ourselves, fighting to unbalance us. 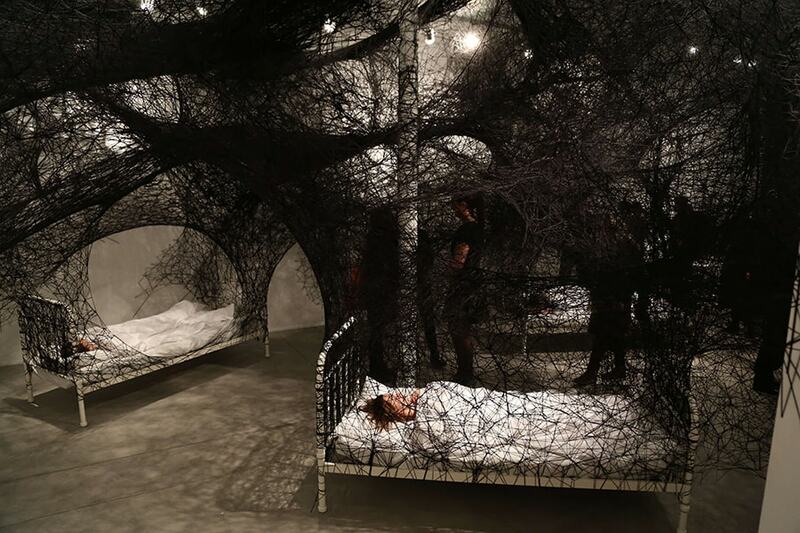 The parallel with humorism reveals once again its accuracy when we observe the objects employed by the artist in installations such as Dialogue with absence and Connectedness to Life, the tubes and beds reverberate as components of the medical universe. 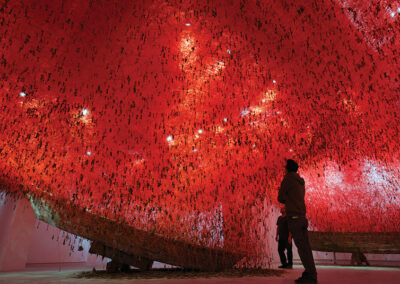 Presumably, Shiota had a near death experience that for evermore marked her work. Human being’s ephemeral passing is enhanced by death beds and metaphors of nothingness in her constructions, even boats can be perceived as intermediary objects transporting to the afterlife. Greeks believed that in order to enter into the underworld, the death’s soul needed to cross the Styx river and pay a tribute to Charon. Therefore, boats for civilization, were a means of transportation also after death. For Shiota these objects exemplify the afterlife journey and life’s voyage during our time on earth. Possibly, less obscure is the meaning behind the colour red as it represents blood, human relationships, hope and vitality. It can also symbolise femininity. 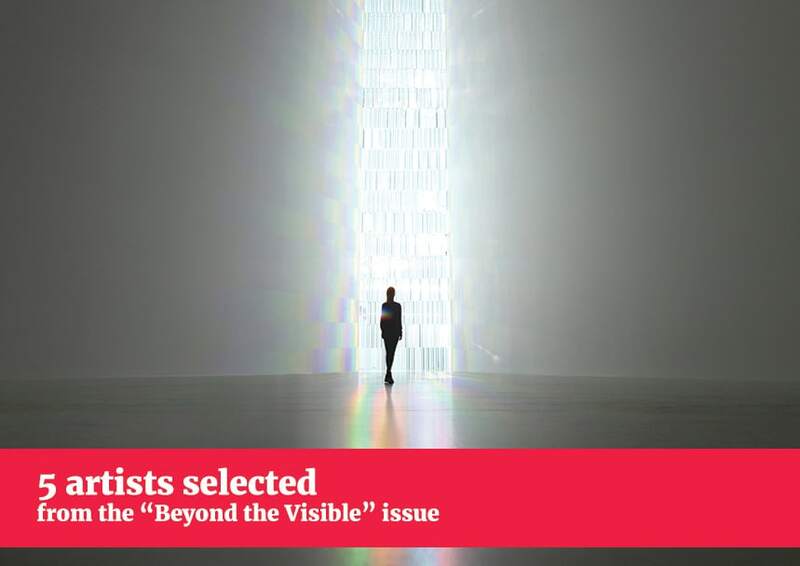 Although the artist doesn’t approve of the feminist perspective as an appropriate reading to her installations, her performance work such as Bathroom or Try and Go Home attests to the deep influence of artists like Ana Mendieta and Marina Abramovic. Moreover, dresses abound corroborating her interest in the female condition once again. 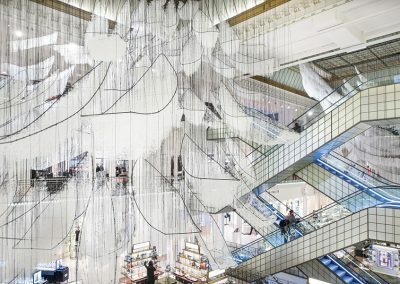 But, if she rejected the idea of labelling her installations as being “feminist”, it is due to her desire to create a universal artwork relating to a wider audience. 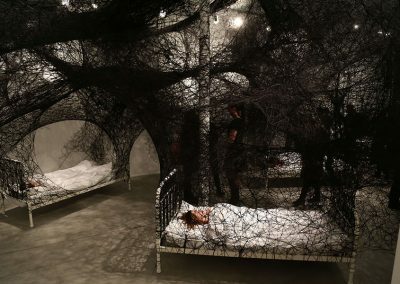 Subjects such as loneliness, dreams and absence have gradually taken over, art pieces like During Sleep, In Silence, Letters of the Thanks or Farther Memory inquire on the human condition. Dreams are indeed quintessential components in Shiota’s work, they are not only evoked in her titles but emerge as the core of her artistic practice. The father of psychoanalysis Sigmund Freud viewed them as coded messages coming from our unconscious, subtly sending information to a strict conscious layer. Unlike the Greeks and other philosophers, Freud considered them healers of traumas. 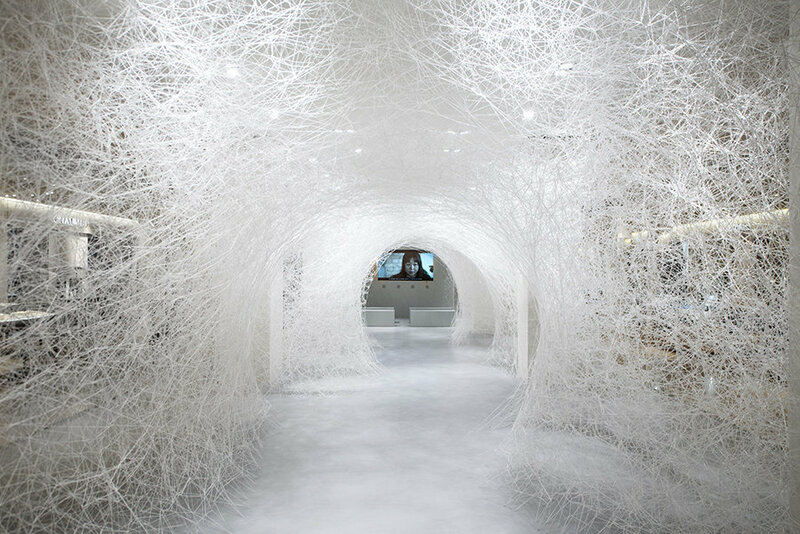 Seemingly for Shiota her thread installations are cathartic experiences where reality and dreams are mixed creating new universes. 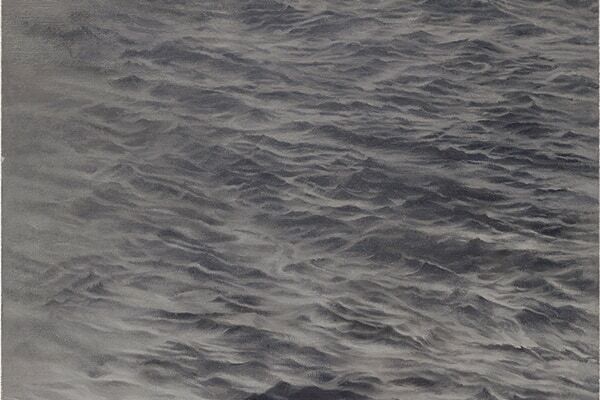 The unconscious finds its voice and its form in her art pieces, and as the spectator walks through her immersive ecosystems he is confronted with outer dimensions, to intimate thoughts and emotions. Empty squares symbolise loneliness and absence, silence and meditative states that interrogate viewers on the essence of life. Although the artist doesn’t approve of the feminist perspective as an appropriate reading to her installations, her performance work such as Bathroom or Try and Go Home attest to the deep influence of artists like Ana Mendieta and Marina Abramovic. 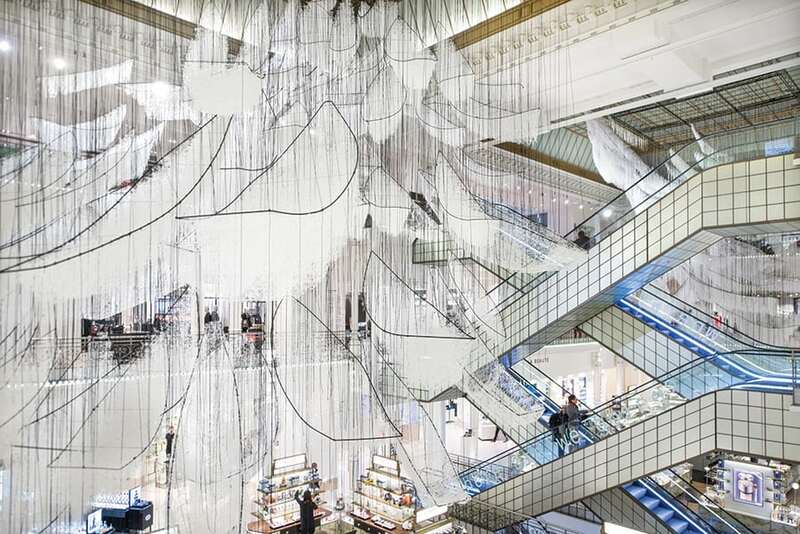 Even if Shiota’s artworks can be visceral and difficult to decipher, a particle of positivity glows and imbues her creations every time we see them. Impermanence and death is perceived not as the end but as the beginning of a new phase. Boats, suitcases and shoes are recurrent motifs embodying mobility and change, they also personify memories; yet another way of remaining alive. 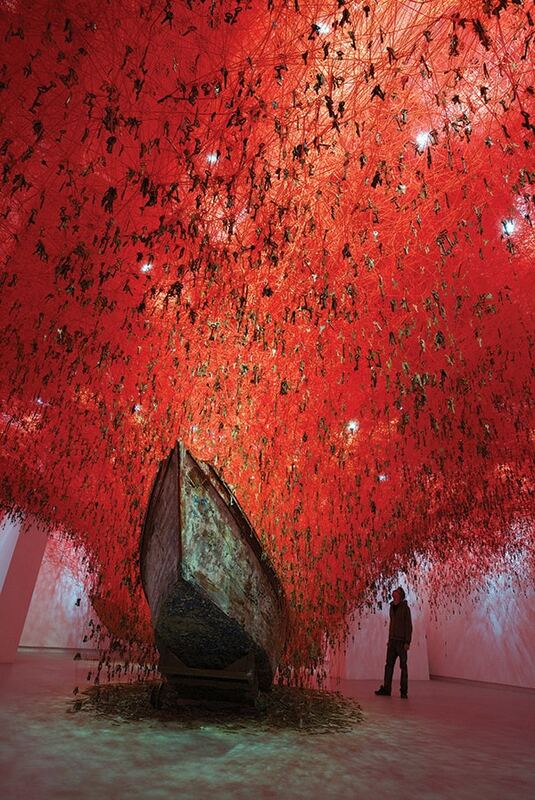 In 2015, for the Japanese Pavilion at the 56th Venice Biennale, Shiota created her installation The Key in the Hand, the ceiling was flooded with red thread, keys were hanged and boats appeared to be anchored to the floor. According to the artist, keys personify trust and infinite possibilities, they reflect prosperous futures. At the end of the experience, a video where children were asked if they remembered something from their time in their mother’s womb was projected. The installation and film delved into memory’s nature, as the children spoke, some of the memories recalled were mixed with imaginary scenarios and real experiences. Nevertheless, how do we discern reality from fantasy? In reality, life and death are connected dimensions and the more we experience Shiota’s work, the more we understand the dominating affinity between life and death. Doors are portals and promises of regeneration, of rejuvenation. 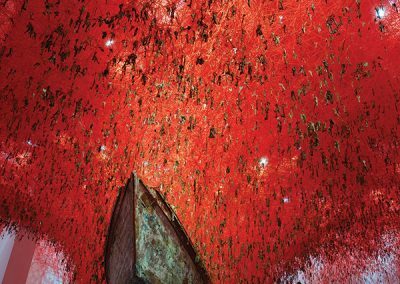 When contemplating The Locked Room red thread appears as less threatening, as bridging experiences and rekindling memories. 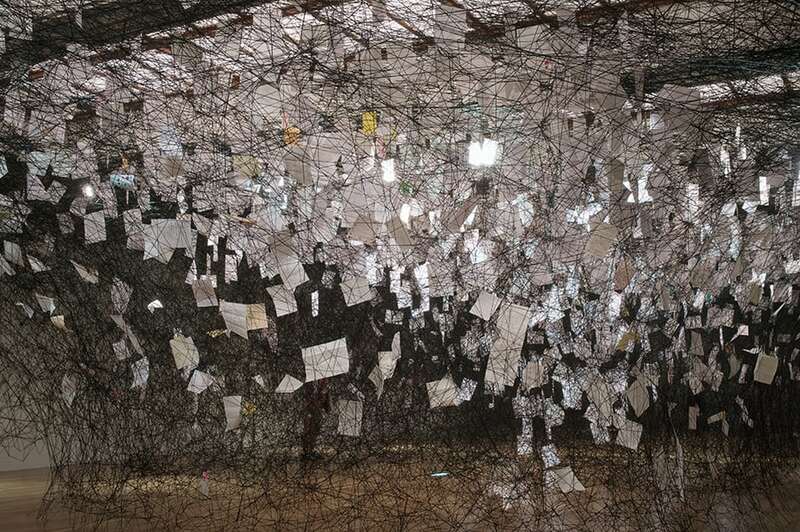 Comparable to Chiharu Shiota’s body of work, firm defenders of humorism believed humors corresponded to the 4 elements and were somehow correlated to our temperament. Despite its inexactness, the theory conceptualized the world as an association rather than something detached. Layers are visibly knotted, once again dimensions are connected and the death-life cycle is restored.